SSAB posted an operating profit of SEK 707 million for the third quarter of 2016, up by SEK 115 million compared to prior quarter. Improved earnings were driven mainly by higher prices and further cost reductions, despite seasonally lower shipments and planned maintenance costs. Compared with the third quarter of 2015, which was adversely affected by the costs of relining the blast furnace in Luleå, earnings were up by SEK 900 million. We are well on track to realizing our cost reduction plan of SEK 2.8 billion, including synergies from the Rautaruukki acquisition, and the savings are now visible in the result. The market situation in SSAB’s home markets, Europe and North America, differed from each other during the third quarter. In Europe underlying demand was stable, when adjusted for normal seasonal slowdown. Also market prices were stable and showed a slight rise due to continued low imports. Provisional import duties on Chinese hot-rolled strip and heavy plate imposed by the European Commission in early October are expected to support price levels in Europe. In North America, demand for heavy plate was weak and prices declined throughout the quarter. This led to reduced orders from Steel Service Centers and lower than expected shipments for SSAB Americas. Imports of heavy plate into the USA remained at a high level. A preliminary decision on import duties on heavy plate in the USA is expected during the fourth quarter. Demand for high-strength steels globally remained stable, although with some seasonal slowdown. SSAB presented in April this year the target to reduce net debt by SEK 10 billion from the end of the first quarter 2016 to the end of 2017. The rights issue during the second quarter of this year raised net SEK 4.9 billion and the net cash flow during the second and third quarters amounted to approximately SEK 1.3 billion. 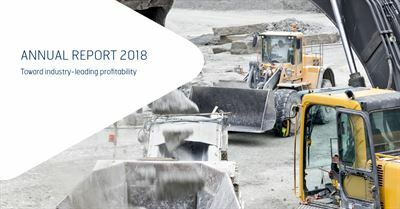 The remaining amount of approximately SEK 3.8 billion will be achieved through cash flow generated from operations, reduction of working capital and a possible divestment of non-core assets. During the third quarter, net cash flow was positive at SEK 612 million and the net debt was reduced to SEK 18.2 billion. During the past two years, SSAB has focused on the integration between SSAB and Rautaruukki and realizing the identified synergies. Going forward, we will continue to implement our “Taking the Lead” strategy with the goal to reach industry-leading profitability through growth within certain prioritized strategic initiatives and by driving efficiency through continuous improvement in all our operations. Our strategic growth initiatives include growth in Special Steels, Automotive and other premium products, as well as increased focus on service and after-market activities. SSAB invites you to a presentation of the results for the third quarter to be held at 09.30am CEST on Friday October 28, 2016. The press conference will be held in English and webcast live on www.ssab.com. It is also possible to participate in the briefing via telephone. This information is information that SSAB AB is obliged to make public pursuant to the EU Market Abuse Regulation and the Securities Markets Act. The information was submitted for publication, through the agency of the contact persons set out above, at 7.30 am CEST on October 28, 2016.